The artillery used in the Battle of Shiloh offers a chilling insight into one of the bloodiest encounters in the American Civil War. According to historians, there were approximately 250 artillery field pieces employed by the Union and Confederate soldiers of which 164 (roughly 63%) were smoothbores and 86 (34%) were rifled cannons. Samples of these armaments and the 51 different types of projectiles used in the bitter two-day skirmish can be seen at the Shiloh Civil War Museum. Your experienced tour guide Larry DeBerry provides a detailed explanation taking visitors on a unique journey through the frontlines of the largest war fought in the western theater. Being the early days of the Civil War, the battle at Shiloh was a testing ground for new artillery. The solid shot, shell shot, case shot, cannister, and grapeshot fell short of expectations. Although these cannon balls and shells worked well in small trials, their flaws were revealed during the bitter two-day battle and some were rarely used again. What may seem surprising to many is that the most devastating type was the cannister. It contained 27 to 48 iron balls inside and was simply a giant shotgun that could only keep up for a few minutes before it needed to be refilled with ammunition. 1. Smoothbore: A cannon whose bore is smooth with no rifling*. 2. Howitzer: A lighter version of the smoothbore, it was designed to throw the same projectiles but with a lighter powder charge and at shorter ranges. A higher trajectory is responsible for its effectiveness. 3. Rifled Cannon: Sometimes called a rifle, it was manufactured either as a rifle having lands** and grooves, or by taking Smoothbores and rifling them (a process which theoretically doubled the weight of the projectile). Many six pounder smoothbores in the North were rifled with the James system which required fifteen lands and grooves to handle the James projectile. These grooves forced a projectile to rapidly spin through the air like a large metal football. The guns could fire further and more accurately than the older style of smoothbore cannon which they replaced. The Rebels (115 cannons with only 13 being rifled) should have been out-gunned by the larger and superior artillery of the North (135 cannons with 60% having the rifled barrel). Unfortunately, the thickly wooded area and close fighting range neutralized any firing advantage the Union had. Artillery was often named after the inventor or based on its physical characteristics. For example, ones that were fired in a rifled barrel were named after the inventor, ex. Robert Parrot – Parrot Shell, Charles James – James Shell, etc. Those that were fired in a smooth bore barrel were named after the solid shot, ex. 6-pounder, 12-pounder etc. 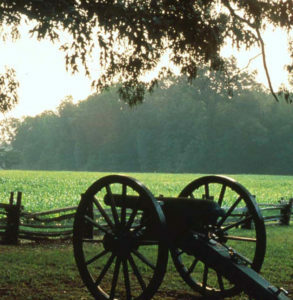 Visit the Shiloh Tours Museum to see the largest collection of Civil War artifacts and relics from the area. In addition to the guns, projectiles and bullets, Larry DeBerry’s unique collection includes pocket knives, spurs-stirrups, uniform buttons and personal items. He also has on display, a complete sponge bucket, gimlet, vent prick, friction primers, limber chest padlocks, different types of fuses, cutaway of round ball and rifled shell showing how they exploded, and many fragments. Enjoy a personalized experience of the Civil War in Tennessee. Call Shiloh Tours at 731-689-3336. Or contact us online to book your guided tour of Shiloh Park and the history museum. You can also email Larry DeBerry directly. *Rifling: The spiral grooves cut or swaged inside a gun barrel that gives the bullet a spinning motion. **The metal between the grooves is called a “land”.